State lawmakers from across the U.S. Southeast — a region known for some the nation’s worst gerrymandering and voting restrictions — are now standing up for redistricting reform, according to a new report from the nonpartisan voting rights group Democracy North Carolina. The organization’s researchers looked at proposed redistricting legislation in nine Southeastern states — Alabama, Florida, Georgia, Louisiana, Mississippi, North Carolina, South Carolina, Tennessee, and Virginia. In the first half of 2017, lawmakers in seven out of nine Southeastern states filed redistricting reform bills, totaling approximately 25 proposals. See more about this legislation in the full report at demnc.co/fairmapssouth. 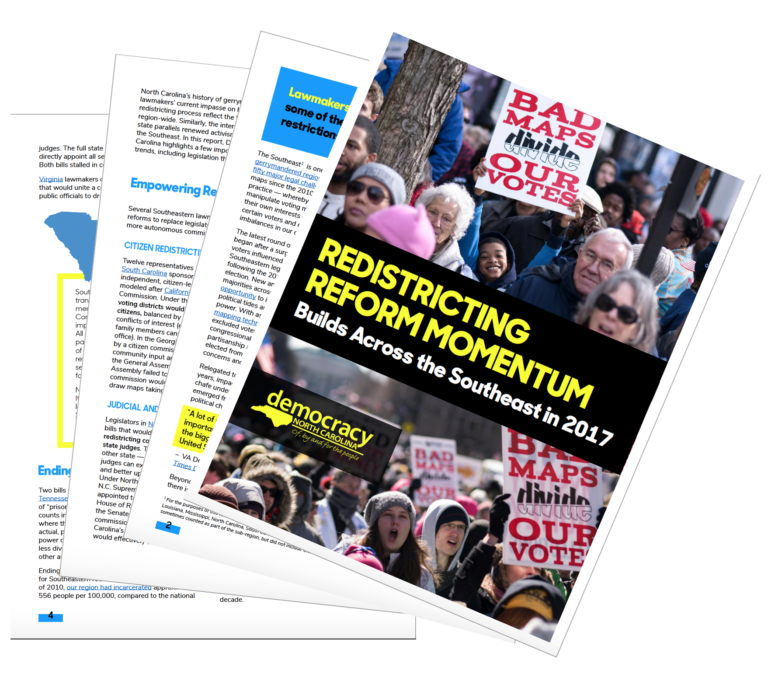 The report highlights important and emerging trends in redistricting reform legislation in the SE, including proposals that would empower citizen-led redistricting commissions, end prison gerrymandering, and restrict partisan favoritism in redistricting. The report also offers recommendations to help ensure that the redistricting reform momentum continues across the region, even in light of current legislative barriers to reform in states like North Carolina. Learn more about North Carolina’s work for redistricting reform at demnc.co/fairmaps. Lawmakers from across the Southeast are now standing up for redistricting reform, according to a new report from the nonpartisan group Democracy NC.